An amazing entry of 57 sprinters from across the globe has been received for the Group One Darley July Cup, run over six furlongs at Newmarket on Saturday, July 14, the third and final day of the Piper Heidsieck July Festival. Boasting a prize fund of £400,000, the Darley July Cup is one of the most prestigious sprints staged in Europe and the third British leg of the Global Sprint Challenge. It also forms part of the QIPCO British Champions Series. The 57 entries include representatives from Australia, Hong Kong, Bahrain and France, in addition to the very best from Britain and Ireland. Star attraction among the three Australian entries is the outstanding mare Black Caviar, who has won all 20 of her starts in her homeland, with no less than 10 of those having come at Group One level. Two races ago she won the Group One Coolmore Lightning Stakes over five furlongs at Flemington on February 18 - the first event in the 2012 Global Sprint Challenge. The amazing unbeaten six-year-old, trained by Peter Moody and the second highest-rated horse in the world, is set to be based in Newmarket ahead of her assault on Royal Ascot and the Darley July Cup over the summer. The Australian challenge also includes the Group One winners Foxwedge and Ortensia. Krypton Factor has proved to be a star for his Bahrain-based owner/trainer Fawzi Nass in Dubai this year, winning the Group Three Mahab Al Shimaal and the Group One Dubai Golden Shaheen, with both those victories coming over six furlongs on Tapeta at Meydan. The Dubai Golden Shaheen was the third Global Sprint Challenge race of 2012. The four-year-old is set for a European campaign over the summer, which should hopefully include both Royal Ascot and the Darley July Cup. He is due to run at Kranji, Singapore, on Sunday, May 20, in the Group One KrisFlyer International, also part of the Global Sprint Challenge. Oliver St Lawrence, racing manager to Fawzi Nass, commented: “Krypton Factor runs in Singapore on May 20 and he should land in England on May 24 with the intention of going on to the Diamond Jubilee Stakes at Royal Ascot and the Darley July Cup at Newmarket. “He has been very well since his victory in Dubai. We eased off a bit but he wasn’t on the go from the end of Meydan last year to the start of Meydan this year so he has hardly had a strenuous time. “He has improved this year because we have brought him back in trip and Fawzi Nass always knew that last year, but he had just turned three so we didn’t want to take on older horses. He had his prep run over eight furlongs this season and then once he was back at six he was pretty unbeatable. “He had good form on turf for Sir Mark Prescott so you would like to think he could hold his own now he is switching from Tapeta and we will find that out in Singapore. The latest French-trained winner of the Darley July Cup was Marchand D’Or in 2008, who was handled by Freddy Head. Head has two potential challengers in 2012, the fillies Moonlight Cloud and Zantenda. The four-year-old Moonlight Cloud landed the Group One Prix Maurice de Gheest over an extended six furlongs at Deauville in August, while the three-year-old Zantenda was a high-class juvenile last season, ending the campaign by finishing third in the Group One Prix Marcel Boussac at Longchamp in October. 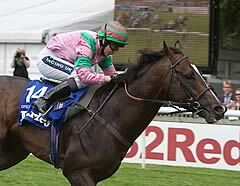 Head commented: “Moonlight Cloud is very well and the Darley July Cup could be a race for her. 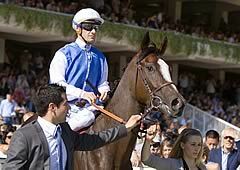 I am very happy and she will reappear in a seven-furlong race at Longchamp in early June. I can’t say she has improved, but sometimes from three to four they get a bit tougher. “I was a bit disappointed with her at Ascot, but I think she could be better than what she showed there because prior to that she was very impressive in the Prix Maurice De Gheest. The international entries for the Darley July Cup also include the Hong Kong superstar Joy And Fun, trained by Derek Cruz. The tough and consistent nine-year-old won the Group One Chairman's Sprint Prize at Sha Tin in February.